When you first visit Erik Winfree's lab, where researchers study how to write algorithms and program the behavior of molecules, it's hard to know what to expect. After all, when Winfree looks at the code that underlies DNA, he sees a programming language. So you might expect to find a scrupulously tidy room, with orderly bookshelves full of carefully bound paperwork. Almost certainly, the space would impress you with the seriousness of the work being done there. But his lab at the California Institute of Technology is nothing like that. In fact, it's full of toys. Winfree, an AAAS fellow, keeps more than 70 small canvases by surrealist Ann Erpino on exhibit. The artwork vividly and disturbingly illustrates scientific discoveries that have inspired him: the points of light in neural networks, the careening angles of fractal figures and, in one case, a mathematical ball of worms. On his bookshelves, scientific journals stand next to a big wicker basket of 3-D wooden puzzle pieces, a set of interlocking metal links and, of course, some beautiful examples of origami. The origami represents the method by which molecular programmers position and build molecules into a targeted shape. With this method, called "DNA origami," researchers bind molecules from a single strand of DNA to molecules from a complimentary strand of DNA. Thus the strand that serves as scaffolding can be folded into a desired shape. "How do you build a frog today?" Winfree asks. "Use this DNA. How do you build a fish today? Use this DNA." "The programming language is the same," he said, \"for really complex machines and living machines." Winfree will tell you that he is a mathematician and computer scientist. 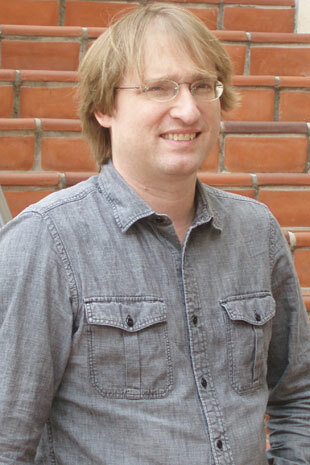 His long title encompasses many fields; he is a professor of computer science, computation, neural networks and bioengineering. But most of his work has appeared in chemistry journals. Chemistry, in his view, is an information technology. In molecular programming, computation can be systematically embedded into molecules with the idea that the embedded information can guide molecular processes. As a graduate student at Caltech in the late 1990s, Winfree wrote an algorithm that directed a strand of DNA from a crystal to self-assemble. When he talks about that project, Winfree credits his adviser at Caltech, molecular biologist John Hopfield, with being "a very hands-off adviser.\" The work won Winfree a MacArthur Fellowship in 2000, at the age of 31, as well as the Tulip Award in DNA computing. He wasn't the first in his family to be named a MacArthur fellow; his father, Arthur Winfree, earned a MacArthur grant in 1984 for research that involved applying mathematics to biology. Aside from his father, who he describes as his first science teacher, Winfree credits more than 30 collaborators in his online biography. Aside from getting headlines and attracting unwelcome enthusiasm from advocates of the notion of intelligent design, Winfree's success in programming DNA as a graduate student launched a career that explores the connection between biology and computation. But his approach to understanding the complexity of life differs from that of a biologist. Rather than taking a living thing and drilling down to see what it's made of, he studies the computational components of DNA. He says he's "looking for simple explanations of how these processes self-assemble." "We're trying to engineer things from the bottom up," he said. In Winfree's view, when two molecules interact, the process resembles something a machine would do. He's researching whether this process can be directed by algorithms. In some experiments, one molecule incites another molecule to complete a computation. Metaphorically speaking: A bird is in a cage, and some other birds come in and open it, and the caged bird flies out. Computationally speaking: Researchers built a neural network behind an oscillator that made a current that computed the square root of a 4-bit number. But Winfree is less interested in practical outcomes than in the research itself. In fact, you could say that he could not be less interested in applications. "This ever-present 'potential applications' question is a scourge," he said. He prefers to bring attention to "the beauty and importance of fundamental research. "Some scientists are 100 percent motivated by the desire to understand the world, to understand what we are as humans, to understand what life is, to understand the beauty of how mathematics and algorithms and information underpin our existence." Ultimately, he is looking at developing programming languages and compilers that describe what kind of system you would build. This, Winfree said, is "not a reality yet." It's not surprising that Winfree once wanted to be a science-fiction writer. In fact, after spending an hour talking about doing computation with the building blocks of life, it's impossible not to ask him whether he gets questions about the potential for his work leading to scary sci-fi scenarios. Do people ask him whether he's developing the DNA of killer robots, like in "The Terminator?" Winfree rolls his eyes a little and breathes out a sigh. "I think that's a generic fear about any technology. It's true that technology is changing the world. We ought to be wise, and generally, we're more capable than wise, as a species. "When you look at things like molecular programming, it makes more sense to understand it than to fear it."